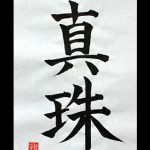 Japanese Kanji Symbols about Jewel. 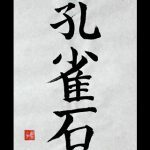 I wrote “Sougyoku“. It’s Japanese kanji symbols for “Sapphire”. It’s one of the birthstones of September. “Sou” means Blue “Gyoku” means a Ball As for the stone words, Love, Honest, Chastity. What jewel Do you like? Please let me know your favorite words about a jewel. I wrote “Menou“. It’s Japanese kanji symbols for “Agate” and “Onyx”. One kind of the agate is one of the birthstones of August. “Me” means Agate and Onyx “Nou” means Agate and Onyx As for the stone words, Health, Wealth, Longevity. What jewel Do you like? Please let me know your favorite words about a jewel. I wrote “Kougyoku“. It’s Japanese kanji symbols for “Ruby”. It’s one of the birthstones of July. “Kou” means Crimson “Gyoku” means Jewel As for the stone words, Ardor, Passion, Innocent love. What jewel Do you like? Please let me know your favorite words about a jewel. I wrote “Shinju“. It’s Japanese kanji symbols for “Pearl”. It’s one of the birthstones of June. 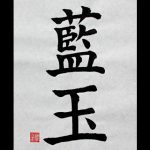 “Shin” means True , Real or Pure “Ju” means Pearl, Gem or Jewel As for the stone words, Health, Wealth, Longevity, Purity. What jewel Do you like? Please let me know your favorite words about a jewel. 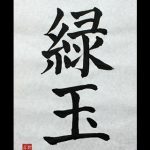 I wrote “Ryokugyoku“. It’s Japanese kanji symbols for “Emerald”. It’s one of the birthstones of May. 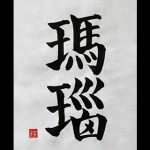 “Ryoku” means Green “Gyoku” means Jewel As for the stone words, Good luck, Happiness, Hope, Stability. What jewel Do you like? Please let me know your favorite words about a jewel. I wrote “Kujaku-Seki“. It’s Japanese kanji symbols for “Malachite”. “Ku” means Cavity or Great “Jaku” means Sparrow “Seki” means Stone Kujaku means Peacock. “Kujaku-Seki” is similar to a Peacock feather pattern, so it’s named “Kujaku-Seki”. What jewel Do you like? Please let me know your favorite words about a jewel. I wrote “Kongou-Seki“. It’s Japanese kanji symbols for “Diamond”. It’s one of birthstones in April. 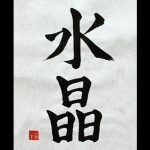 “Kon” means the metal “Gou” means strong or hard “Seki” means the stone As for the stone words, Eternal bond, Chastity. What jewel Do you like? Please let me know your favorite words about a jewel. I wrote “Suishou“. It’s Japanese kanji symbols for “Crystal” or “Quartz”. It’s one of birthstones in April. 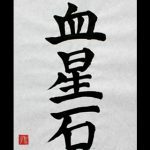 “Sui” means the water “Shou” means the crystal As for the stone words, Purification, Perfection and Mysterious. What jewel Do you like? Please let me know your favorite words about a jewel. 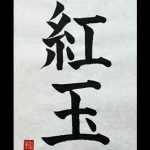 I wrote “Rangyoku“. It’s Japanese kanji symbols for “Aquamarine”. It’s one of birthstones in March. 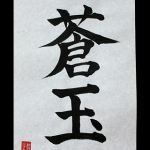 “Ran” means “indigo” “Gyoku” means “jewel” As for the stone words, Wisdom, Knowledge and Intelligent. What jewel Do you like? Please let me know your favorite words about a jewel. I wrote “Kessei-Seki“. It’s Japanese kanji symbols for “Bloodstone”. It’s one of birthstones in March. 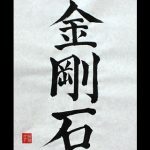 “Ketsu” means “blood” “Sei” means “star” “Seki” means “stone” As for the stone words, Wisdom, Industrious and Efforts. What jewel do you like? Please let me know your favorite words about a jewel.